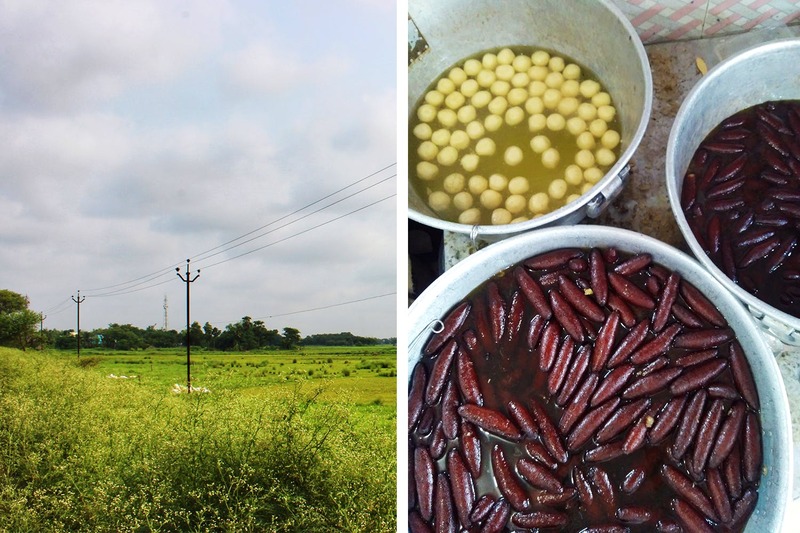 It’s a two hour road trip down NH2, past fields teeming with lush vegetation to Shaktigarh, the land of Bengal’s fav deep fried sweet – the langcha. Located 80km from Kolkata, Shaktigarh falls under Burdwan district and can be reached via National Highway 2 within two hours. It’s a popular stop to hog at for many travelling to Burdwan, Durgapur or Shantiniketan. The langcha stretch is easily recognisable when a large number of small establishments crop up on the side of the highway with boards shouting Langcha Bhaban, Langhcha Mahal, Langcha House, and more. These are all small joints laid out with plastic tables and chairs and walls framed with photographs of popular actors, singers and ministers who have gorged on their famous sweets. The langcha dough is made from cottage cheese, khoya, sugar and flour which is deep fried in ghee and dipped in sugar syrup and costs about INR 10. People also stop here for a quick breakfast before carrying on along the highway. At INR 20, plates of hot kochuris served with alu tarkari (a side dish made of split Bengal gram and potato) are popular. Or try the shingaras (Bengali samosa). Each shop stocks up their counters with a few other popular sweets for anybody who dares to turn away from their langcha. For those who are health conscious, sugar-free options include special dahi. End your meal with a hot cup of chai and strike up a conversation with the owner at the counter. They are always eager to share the history behind their beloved langcha, and maybe even share some gossip about famous personalities who have stopped by. On way, one can find men selling coconut water on the side of the highway where you can stop for quick hydration and take a moment soak in the rural landscape.